Win tickets to 1st Finance and Career Summit. 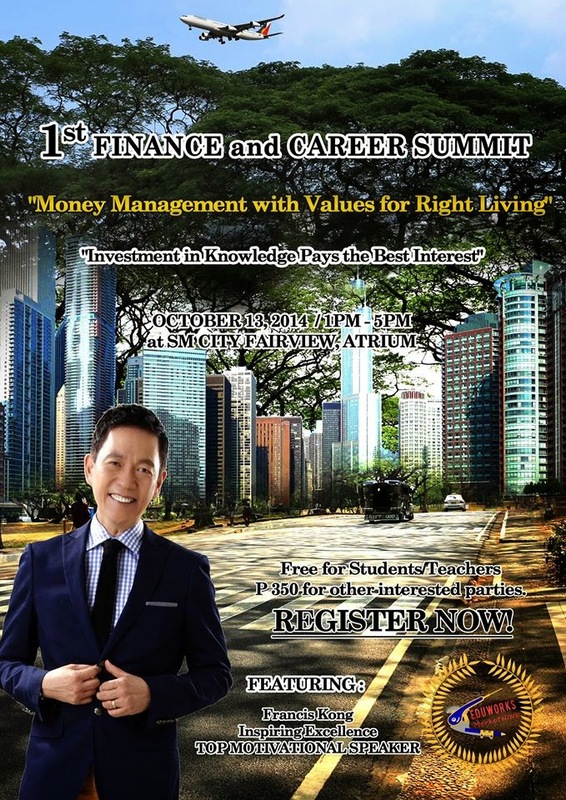 Get to meet Francis Kong - the most respected lecturer and inspirational speaker, President of Success Options Publishing Company and President of FunWorks Inc. on October 13, 2014; 1PM - 5PM at SM City Fairview, Quezon City. The seminar is FREE for Students and Teachers, just bring a valid I.D. A minimal participation fee of P350 for the others who wants to be a part of this beneficial talk. Here's how to win 2 tickets: Follow this blog publicly by clicking the join this site button, at the right side, under my photo.